Would you make a good nuclear medicine technologist? Take our career test to find out how you match with this and over 800 other careers. What is the workplace of a Nuclear Medicine Technologist like? A nuclear medicine technologist is someone who is able to operate equipment that can create images of certain areas in the body. By preparing and administering radioactive drugs, known as radiopharmaceuticals, any abnormal areas in a patient's body will appear different from normal areas in the images. Physicians and surgeons will then interpret the images to help diagnose a patient’s condition. Radioactive drugs give off radiation, which allow scanners to show higher-than-expected or lower-than-expected concentrations of radioactivity. For example, a tumor is able to be seen in an organ during a scan because of the concentration of the radioactive drug. Nuclear medicine technologists are highly specialized healthcare professionals who work closely with nuclear medicine physicians. Nuclear medicine involves the combining of chemistry, physics, mathematics, computer technology, and medicine in order to use radioactivity to diagnose and treat disease. Nuclear medicine procedures are safe, they involve little or no patient discomfort and do not require the use of anesthesia. This type of medicine offers information about both the function and the structure of almost every major organ system within the body, and is what separates nuclear medicine from other imaging modalities such as x-ray. Are you suited to be a nuclear medicine technologist? Nuclear medicine technologists have distinct personalities. They tend to be investigative individuals, which means they’re intellectual, introspective, and inquisitive. They are curious, methodical, rational, analytical, and logical. Some of them are also realistic, meaning they’re independent, stable, persistent, genuine, practical, and thrifty. Does this sound like you? Take our free career test to find out if becoming a nuclear medicine technologist is right for you. 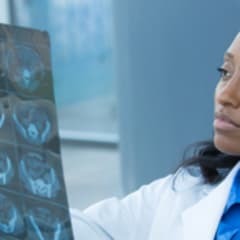 Nuclear medicine technologists work in a wide variety of clinical settings, such as community hospitals, university-affiliated teaching hospitals and medical centres, outpatient imaging facilities, medical and diagnostic laboratories, offices of physicians, public health institutions, and government and private research institutes. Most nuclear medicine technologists work full time, and some work evenings, weekends, or overnight because imaging is sometimes needed in emergencies. Technologists are on their feet for long periods and may need to lift or turn patients who are disabled.